DISGRUNTLED Zimbabweans living in South Africa yesterday ratcheted up pressure on President Cyril Ramaphosa’s government to deport Vice-President Constantino Chiwenga, who was reportedly admitted to a Cape Town hospital after he fell ill last week. The protesters picketed at Groote Schuur Hospital, demanding that Chiwenga be sent back to Zimbabwe to seek medical treatment at the country’s health institutions with a demoralised and ill-equipped medical staff. Although government has remained mum over Chiwenga’s ill-health, the former army general, who has been battling ill-health since November 2017 when he facilitated former President Robert Mugabe’s ouster, is believed to have been flown to South Africa for specialist treatment after his health deteriorated last week. Highly-placed government sources said the VP initially sought medical attention at the Avenues Clinic in Harare on Wednesday before going home, but his situation took a nose-dive, forcing him to fly to Cape Town. Armed with placards and replicas of the Zimbabwean flag, the diasporans spent the day camped outside the Groote Schuur Hospital in Cape Town, protesting against Chiwenga’s presence in the country. Some of the placards read Chiwenga go back home, Chiwenga stop killing Zimbabweans, with the general message that government leaders should not get access to quality healthcare outside Zimbabwe, while the majority of citizens were forced to seek treatment at poorly equipped hospitals back home. Pearl Matibe, spokesperson for Zimbabweans based in the diaspora, whose organisation has led a wave of demonstrations against President Emmerson Mnangagwa’s government in South Africa, Britain and the United States, said the Cape Town demonstration was spontaneous. “Citizens who are concerned over the state of affairs in Zimbabwe, just came together without being organised; this was an instinctive demonstration which is just a call on leaders to develop their own health institutions instead of looting taxpayers’ money to access healthcare in other countries,” she said. Information minister Monica Mutsvangwa yesterday said she was unware of Chiwenga’s alleged hospitalisation in South Africa. “I am not aware of that, let me find out and I will come back to you. I am not aware that the VP is in South Africa, I will first need to ask and come back to you,” Mutsvangwa said. 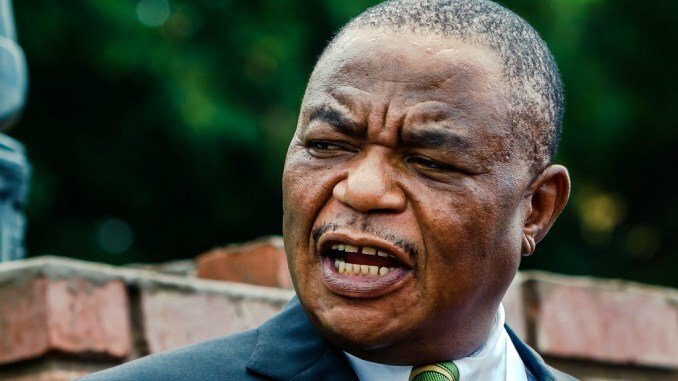 South Africa’s Department of Health in Western Cape confirmed the protests, but denied reports that Chiwenga was admitted at the health institution. “The Department of Health is aware that a group of Zimbabwean citizens have gathered at Groote Schuur Hospital to protest against the alleged treatment of Zimbabwean Vice-President Constantino Chiwenga at our health facility. In honour of our commitment to patient confidentiality, we cannot discuss patient details, however, we can confirm that he was not or currently is an inpatient at the hospital,” the institution’s spokesperson Alaric Jacobs said in a statement yesterday. “While we understand the concern of the Zimbabwean community, we need to balance this with rights of other patients to receive care,” Jacobs said. The demonstrations came as South Africa’s biggest labour union and strategic partner to ruling African National Congress (ANC), Congress of South African Trade Unions (Cosatu), in conjunction with the International Cross Border Traders’ Association, have threatened to stage a solidarity march with the Zimbabwe Congress of Trade Unions at Beitbridge Border Post tomorrow. The demonstration is part of efforts by various civic groups to pile pressure on Mnangagwa’s government to “stop the abduction and harassment of political activists” and resuscitate the country’s comatose economy. Opposition MDC deputy national spokesperson Bekithemba Mpofu said his party, in its policy document prior to elections, highlighted that the health service industry must contribute significantly to the building of a $100 billion economy. He said failure to develop health service was, therefore, a missed opportunity. “It is, however, important to highlight that going for medical attention abroad is a sign of lack of care by a government, which says the local public health delivery system is good for you, but not good for us, yet abusing public resources flying to foreign health centres,” Mpofu said. Zapu spokesperson Iphithule Maphosa said Chiwenga must be deported to Zimbabwe so that he uses the facilities he and his government have neglected and allowed to run down since 1980. “If the facilities in Zimbabwe are good for the ordinary person, they surely are best for the government officials. South Africa must stop the Zanu PF and government looters if at all lives are important. Giving comfort to Chiwenga translates to condoning the mismanagement and rights violations currently taking place in Zimbabwe,” Maphosa said. Doctors recently embarked on a 40-day national strike, demanding better working conditions, equipment and drugs, among other things, to enable them to save lives. Chiwenga fired the 553 striking junior doctors, before other practitioners joined in, crippling the public health sector. The Thokozani Khupe-led MDC-T said although they wished Chiwenga a speedy recovery, they were equally annoyed by his hypocrisy. “However, we cannot overlook his hypocrisy and indictment against the very government which he’s number two in the leadership hierarchy. Our people are dying like flies due to lack of access to adequate and affordable healthcare which his government is responsible for destroying over the past 39 years,” the party said. The Vice-President and his wife, Marry, have been showing signs of illness, with visibly swollen hands and discoloured skin patches, a condition he attributed to poisoning. The post Pressure on SA to deport Chiwenga appeared first on NewsDay Zimbabwe. Monica doesn’t know where her own VP is. Talk about the blind leading the blind!!! Does she know where the President is at right now?